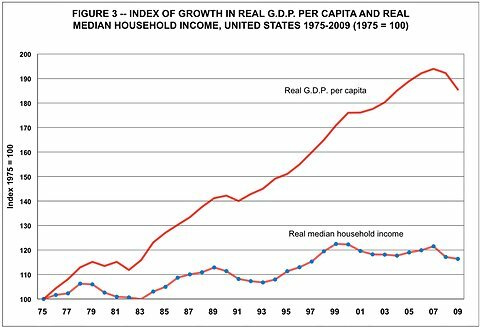 What Does ‘Economic Growth’ Mean for Americans?, by Uwe E. Reinhardt, Economix: ...The third chart, below, exhibits the growth path of real G.D.P. per capita in the United States over the period 1975-2009 and the corresponding path of real median household income. The data show that over the 34-year period, real G.D.P. per capita rose by an annual compound rate of 1.9 percent. ... [H]owever, median household income in the United States rose by less than 0.5 percent a year..., that 1.9 percent average economic growth does not mean much for the experience of the median household in the United States. Average real income per family in the United States grew by 32.2 percent from 1975 to 2006, while they grew only by 27.1 percent in France during the same period, showing that the macroeconomic performance in the United States was better than the French one during this period. Excluding the top percentile, average United States real incomes grew by only 17.9 percent during the period while average French real incomes — excluding the top percentile — still grew at much the same rate (26.4 percent) as for the whole French population. Therefore, the better macroeconomic performance of the United States and France is reversed when excluding the top 1 percent. In other words, if one took away the top 1 percent highest-income recipients and their share of income and focused on what was left for the bottom 99 percent, the median representative of that cohort should not be all that impressed by economic performance in the United States relative to their peers in other countries. It can help explain why the so-called median American voter ... seems so angry at this time... It also can help explain why the high-income groups in the United States have accounted for a growing share of total federal taxes paid in the United States. I wonder how many people know that our superiority over France during this time period is only because of the top 1%?